« Time to Step on the GAS? Canon and Nikon have both now reported their sales for the holiday quarter (calendar Q4, 2018). As I've been noting a lot lately, we're in a transition period, and that transition is definitely showing up on the bottom line of both companies. Green is interchangeable lens camera volume quarter by quarter, while blue is compact camera volume. The two red lines show the trend over the last three holiday periods (top one is ILC, bottom one is compacts). Not a good trend. 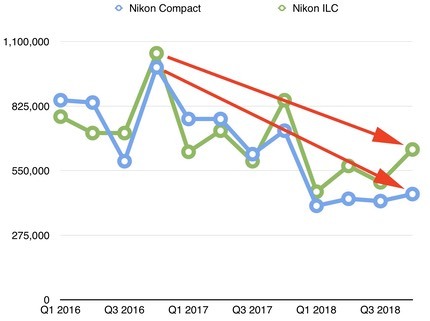 But Nikon specifically called something out in this quarter's presentations in Tokyo that's interesting: the high-end ILC volume is not changing, it's going as they planned and they're not changing any of their forecasts in that area. While Nikon doesn't specifically call out what cameras are in that group, I'd assume that it's the Z6, Z7, D850, and D5. Maybe the D500 and D750. Here's what they say about entry and mid-range cameras: "down 150k units." Let's put that in perspective, that's a 150k unit decline on a grand total of 2,250k units (and that decline year to year was already 370k units the previous year). Put another way, the lower end of ILC—which I assume to mean D3500, D5600, D7500, and D610—is reducing Nikon's ILC volume almost 10%. This is despite a planned average selling price decline of 10% overall. Yikes. Based upon Nikon's statements, it doesn't seem like there will be a new camera body coming this quarter. 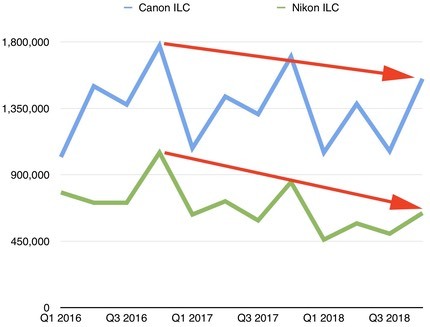 Nikon is managing the Imaging Products Business through the end of their fiscal year as a controlled descent. Nikon is basically hurting at the entry level, not the top level. That's been a pattern with them before: introduce high, do well, add consumer products, and eventually the consumer products go bust and they return to prosumer/pro high-end as their foundation. Note I didn't write "start growing," but instead wrote "stop contracting." Growth will take something much more dramatic than fixing their entry and mid-level cameras and rationalizing their camera lineup. Meanwhile Canon—whose fiscal year is the calendar year and thus they've just reported their final 2018 results—doesn't look a lot better, just bigger. Image System sales dropped 11.3% year to year, and profit dropped 32.6%. They predict another 3.9% drop in sales and 12.8% drop in profits for 2019. We get a decline in ILC units of 9%, and for compact cameras of 22%, with another 7% decline in ILC units expected in 2019. The now almost boilerplate verbiage: "improve profitability" though expanding the high-end (full frame models and higher-end lenses). Blue is Canon ILC unit volume for each quarter, green is Nikon ILC unit volume. The red lines again are the holiday season trend line. Unfortunately, Sony doesn't report unit volume numbers other than as an aggregate for all still cameras (compact and ILC together). But it's pretty clear that all three companies expect to duke it out in full frame mirrorless as a point where they can return reasonable profits on lower volumes. The real question in my mind is where does the ILC decline flatten out? 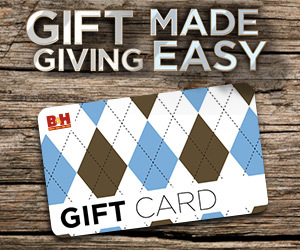 And what is the mix of models that are being sold when that happens? Those things are still unknown, as we're in a transition period still. But I'd say for interchangeable lens cameras, you really don't want to have too many models, you want to have the right models.